It's late October in Minnesota, and that must mean it's time for... Playlabs at the Playwrights' Center (you thought I was going to say Halloween, didn't you). In this week-long festival, three of PWC's core writers have the opportunity to work with a group of actors, a director, a dramaturg, and sometimes a designer on a new work. With just a few days of rehearsals, the plays receive two public readings, often with much rewriting between the two. 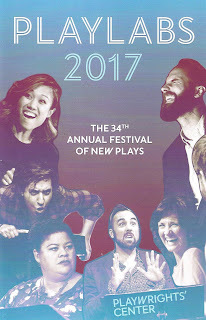 This year I attended the final readings of all three plays, and was once again blown away by the creativity, thoughtfulness, and innovation of playwrights, as well as the talents of actors (many from the #TCTheater scene) in bringing these plays to life, even while standing in one place reading from a script. In the year since last year's Playlabs Festival (the first I attended), I've become more aware of the work that The Playwrights' Center does, and just how far-reaching that work is. For over 40 years, Playwrights' Center has supported the development of countless plays across the country and right here in Minneapolis/St. Paul. As Artistic Director Jeremy B. Cohen noted, the apostrophe in the name of the center means that they're there to serve the playwright, to support them in whatever way they need in the play development process. That's a hugely important (and, I think, often underrated) service. We often complain about doing the same old plays over and over again, or wonder how to make old plays relevant. Here's one way - write a new play! With our tumultuous and fast-changing times, we need art to react to what's going on in our world, to hold up a mirror, to start a conversation. All of these plays do that. Playlabs is over for another year, but The Playwrights' Center has frequent public readings, often free, so follow them on Facebook and check out their events page for upcoming opportunities. The next big event is the Ruth Easton new play series, in which a new play is read by a talented cast the first Monday and Tuesday of every month, December through April. Here's a description of the three plays read last week. Watch for them at your local (or national) theater! Olive Chung comes to the Twin Cities to work on a new play and reconnects with her grad school friend Liz Manuel after being out of touch for a decade. While staying with Liz and her wife, Sharine Hopewell, and their pups, Bell and Musco, Olive gets what she thinks is food poisoning. It turns out to be much more mysterious and severe than anyone imagined. A play about the guest/host space, infection, the performance of normalcy, unseen presence, the body rebelling against the mind, optimism, gratitude, and, yes, friendship. Ella gathers her family together for the holidays to have the delicate conversation surrounding her end-of-life plans. But the emotionally strenuous conversation does not go as she had hoped. So the discussion happens again. And again. But each time another family member is missing, and the conversation goes slightly differently, until it becomes apparent that the end of Ella’s life isn’t the only approaching tragedy for which a plan needs to be made. Because time is running out.